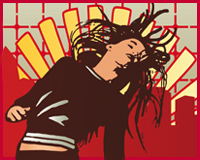 Free vector art illustration of a downtown girl, jumping in the air. Urban vector graphics with sunrays, skyscraper building and pop art grid, ready to use to create eye-catching artworks, flyers, posters, motion graphics, print and web design. Download and enjoy! 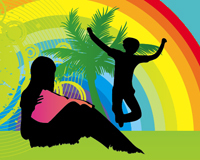 Free vector illustration of a perfect day in paradise: people silhouettes, palm tree, flowers, birds and butterflies clip art, rainbow graphics and abstract circles and swirls background. Beautiful free vector stock art for your spring & summer nature design themes. Download free paradise vector artwork in Adobe Illustrator AI, EPS, SVG and PDF vector art format at Vector.NET, your online graphic design and illustration inspiration gallery. Free vector art pack with large variety of vector clip art, stock icons, symbols, abstract graphics, people illustrations, nature elements and plenty of other cool vector goodies. Cutting edge graphic design demands fresh ways of bringing your ideas to life and to communicate your message. One of the secrets to creativity is knowing how to find the best design footage to help you translate the visual zeitgeist. Download XL free vector art pack to kickstart your design projects. 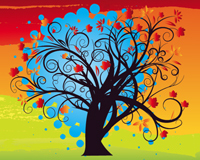 Free Autumn and Fall season vectors collection. Add some Autumn magic with this wonderful free Fall nature vector stock footage. Autumn is a season of change, a time of comings and goings, caprice and wonder as the world of nature makes preparations for the winter. Summer flew by and autumn is here: it’s harvest time, leaves fall and birds travel to warmer places. As the days shorten and cool, Fall is the perfect time to be inspired and find time to create your own art. 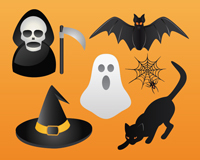 Free Halloween vector art pack with 11 scary, evil, spooky, cute and funny vector illustrations. Halloween is quickly approaching, so download this freaky vector stock footage collection to create creepy crawly artworks for your Halloween invitation, party poster or website decoration: pumpkins, bats, black cats, spiders, ghosts, monsters, witches, monsters and zombies. 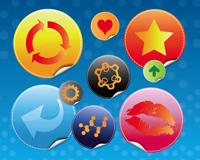 Cool set of vector art glass buttons, icons and logos for your website or blog. Colorful and poppy vector clip art and vector stock footage for graphic designers, illustrators, vector artists and web developers. 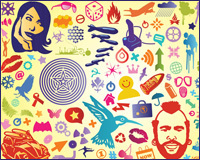 Download this great mix of vector badges for free in typical web 2.0 style, plus original symbols. Enjoy! Free anti-war vectors inspired by protest against hate, violence and destruction. 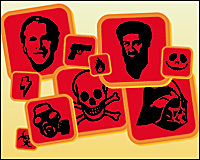 Vector art collection with illustrations of former president George Bush, Osama bin Laden, skull, radioactive danger sign, gun silhouette, Darth Vader, Borat, bio hazard icon, gas mask, fire and explosion symbols. The peace process after the recent years of terror and horror will be difficult and long. As the old saying goes, there are no winners in a war, only losers.